Consider the cliché: a darkened room, a bleary-eyed middle-aged man collapsed into a couch, beer in hand, TV-flicker illuminating his sallow stubbled face, and a stomach threatening to escape from his pants like a giant mutant amoeba. Blame that belly on the beer? Not so fast. According to University of California Davis food science professor Charles Bamforth, the colloquial notion of the beer belly — that beer somehow uniquely targets the gut – doesn’t jibe with medical science. Alcohol doesn’t have V.I.P. dibs on abdominal fat in other words (any more than spot exercises like sit-ups burn stomach chub), it’s just another ingredient in your caloric regimen, though Bamforth notes that in cases of excessive alcohol consumption (read: abuse) you can develop something called ascites: a buildup of fluid around your abdomen that can cause distension of a sort, though in that case it’s likely related to actual liver damage. 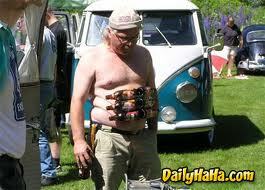 So where did this idea that beer consumption spawns belly fat come from anyway?